Update 1: A new build has been released of this beta, this one has been listed with the only change being CAPTCHA is set to disabled by default, however it is 2KB larger so perhaps they have changed something else. I have updated download links below. Update 2: The final release of this firmware has been posted, check below for the download link, click here to read about it. Update 3: D-Link has released a new beta firmware for the DIR-655 here, it ONLY fixes *a* SharePort issue. D-Link have just uploaded a new beta firmware release for the DIR-655, this fixes issues with SharePort and fixes that CAPTCHA security leak that could cause the router to give out the admin password. I have not tested it personally so I am unaware of any issues however others at the D-Link forums have experienced no problems so far. There are also no reports of this fixing the lockup issues users of the 1.31 firmware were experiencing but it isn’t mentioned in the release notes, we will know for sure though in a few days. Update: Some users are reporting great success with the new firmware and SharePort, lets hope that continues, also there has been a report from a Mac user stating that after upgrading the firmware the admin page was unable to be used in Firefox or Safari on OSX so keep that in mind those that don’t have a Windows PC just in case. 1. Fix potential security leak with CAPTCHA. 2. Fix USB LED issue aboutShareport. Again this is beta firmware so it comes with the added disclaimer of possibly damaging your router, you can download the firmware below, I have made a mirror hosted here so if they take it down it will still be available here. Many compliments on the information imparted above. As a person using OSX and XP Pro SP3 on my MacBook Pro, I applaud D-Link in trying to add Sharepoint and greater functionality that was originally marketed when selling the router with the USB port. Unfortunately, as I understand it, the 1.31 firmware when installed, still has problems with lock up, Sharepoint not working properly and forcing users to manually connect their printers each time they wish to print. In addition to this, if you are an OSX user, as I am, if you try to install the firmware, you cannot get past the admin pages. I can tell you this, with my MacBook Pro, I’m using 1.21 ver Firmware with no problems. I’m a screwed up or what Maybe because I have XP and loaded…it’s working. When D-Link is able to fix this problem, I wonder if I can switch back to the OSX version some time in the future. I applaud for helping and replying so quickly to everyones needs. I’m glad before I tried to upgrade to the latest firmware and recognized the d-Link warning that I checked the web. All I see is grief,, But Ben seems to have been able to solve must of the problems for windows users. I will not be upgrading soon. To me, the problems appear pretty serious. 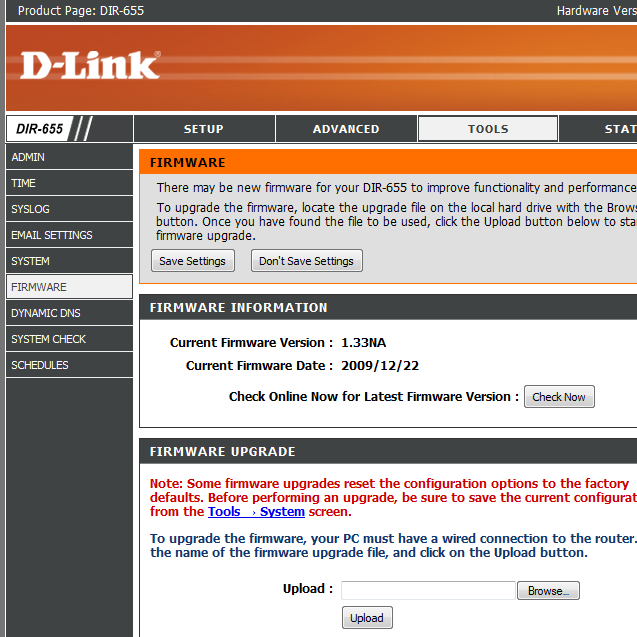 D-Link appears pretty slow in providing fixes to it’s firmware. Well I have firmware 1.32NA and utility 1.10 and its been a total nightmare. My vista PC use to recognize and connect to the shareport items but now while it recognizes the items as present it cannot connect. (it bounces from available to connecting then back to available). My Mac it connects (but says it fails) and won’t let go of the connection going so far as to immediately reconnect after disconnecting (while still saying it failed to connect). Same thing is happening with me…firmware 1.32NA and utility 1.10…shareport is saying the device is available…like printer….tried connecting then it goes back to available. Is there anyway of reading the old settings file? If you are upgrading from anything pre-1.3x then the config file will not work, I don’t think there’s any way of getting it working either unfortunately. Nightmare is the word. I can’t use this bin file for the life of me. I’ve tried every darn mounting program and the file doesnt even work for me. Why wouldnt they just make an exe? It’s not a CD image, it’s a firmware image, you have to upload it using the firmware uploader in the administration page of the router, it’s on the Tools/Firmware page.